If you are searching for Best GST software in India, you are at the right place. As GST is India’s largest tax reform since Independence in the indirect taxation system in India. A number of established, as well as startup companies, are emerging to support this new tax with a wide range of accounting software. With Tally.ERP 9, you can generate GST-ready invoices from the get-go. 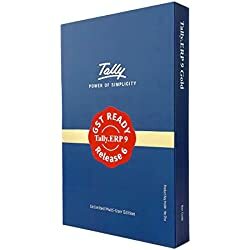 Tally’s GST Software handles all the GST invoicing/billing needs, from simple invoices/bills to advanced ones with multi-item, multi-tax rates, and so on. The software can also manage advance receipts, reverse charge scenarios, branch transfers, bill of supply, export invoices, input tax credit, and other adjustments. GST returns can be in harmonious sync with your books of accounts, and reflect the same data as used for filing returns in the GSTN portal. Tally.ERP 9 has the capability to detect errors, which means you can file accurate GST returns without too many hassles. GST return filing has been made with Tally.ERP 9. You can generate GSTR-1 and GSTR-2 in JSON format and directly upload in the GSTN portal, whereas GSTR-3B can be printed in a word document for filing GSTR-3B in the portal. With Tally’s “Marked Voucher” feature, update the tax consultant/client on the changes made by sending a list of only the updated invoices. The software also gives the ability to print invoices with complete item-wise and rate-wise tax breakup details. One can see tax details (CGST, IGST, SGST, Cess) individually for each line item. Zoho Books is one of the Best GST Software that is a ready accounting which lets you send invoices, reconcile bank transactions, track inventory, generate reports, and file GST returns effortlessly. This Software helps built and handle GST calculations for you. You have to set up different GST rates applicable to your business and Zoho Books can calculate the tax for each sale and apply it to your invoice instantly. This reduces the chances of making errors in tax calculations. In Zoho Books, all the details of both the seller and the customers, along with the HSN code, and the corresponding GST rate are automatically filled in when invoices are created. The software also comes with fully customizable invoice templates. This means you can add and rearrange information fields in your invoice templates as needed. You can also set your own format for the invoice numbers that are generated automatically when invoices are created. There are 11 types of GST returns that must be filed by various kinds of taxpayers and at various times – you can file GSTR1, GSTR2, and GSTR3 within the software in a single click. All your sales and purchase information are automatically sent to the Government by Zoho Books when you file returns. To help you ensure that you file your returns on time, you will be notified automatically a few days before the filing deadline every month. Zoho Books syncs with the GST Network portal, where all the details pertaining to your returns and your vendor’s returns will be stored. When your vendor submits his or her returns, which includes details of your transactions through the portal, it will be fetched to your Zoho Books accounts automatically. Reach accounting software is one of the Top 5 Best GST software in India. It is a user-friendly software that customizes with your business with ease. It allows you to control your business wherever you are. Cloud Accounting software centralizes your whole organization, providing easy accounting solutions with advanced business tools to work easily. But the Accounting software with all the advanced features may cost higher. Hence Small & Medium sized enterprises cannot afford it. The software helps manage your Sales, CRM, Billing, Manufacturing, Accounting and Inventory across all your branches with a single web-based software. Unlike a traditional Accounting software, Reach is accessible through mediums like your Gmail or Facebook account. so, many employees can work using the software at the same time. There are 20 different types of Invoices and customize the Invoice with your Logo and Tag-lines to choose from. This makes your Invoices and communications with your customers look professional and complete. Reach being on the cloud allows you to access key information like current Bank Balance, Daily Sales, Daily Expenses and Daily Profits on your Mobile phone. The software also lets you create unlimited users and control what they are allowed to do. You can create separate logins for your Accountant, CA, Partners, and Sales Staffs. HDPOS is one of the best GST Software for accounting. It has ease of use and nice interface and has all the features you will need to manage your business. You will really like the picture based interaction and tons of customizations it has to offer. Besides managing business-related data HDPOS smart can also design and print your barcode stickers, discount coupons and product serial numbers, either on pre-cut sticker sheets using a laser printer or a sticker printer. The software also has complete support for SMS and emails. You can have specific messages sent to your customers and suppliers via SMS or emails at various points in the application. This customizable billing system offers lot more customization, flexibility besides configuration settings. You can add any number of data fields of different data types to many of the objects in this billing system. For example – a garment shop, you can customize your product details by adding color, gender, size etc. HDPOS smart helps you to restrict access to areas of application from a specific computer. You can create logins for your employees and setup Access rights. For example, you can restrict the cashiers from editing and deleting bills. The software can also smart remove all the complexities of Barcode management and provide an extremely easy way to generate and print your own Barcode stickers. ProfitBooks is a simple and fastest business Online and Best GST Software for accounting for small businesses owners in India. It lets create beautiful invoices, track expenses and manage inventory without any accounting background. Apart from the general accounting systems, you can customize invoice numbers, footer information, and change template. Add custom fields to capture more information related to your business process. The ProfitBooks GST software helps you know where your money is going and organize your spending easily. ProfitBooks lets you: attach scanned expense receipts, categorize expenses according to projects, record payment made to vendors, track your payables, record stock purchases and create professional purchase orders and send them directly to your vendors. ProfitBooks has the feature to Automate your invoices by setting a frequency for future billing. This feature can save a lot of time when you need to bill your clients periodically (monthly, yearly, etc). Convert an estimate to invoice, create delivery challans from the invoices or directly email invoice PDF to your clients. Get all your bank accounts in one place. Easily record cash withdrawals, deposits, and transfers from a simple interface. Unlike traditional (read complicated) accounting systems, you don’t need to worry about the debit-credit effect. Record the transactions as they happen and all the necessary accounting will be automatically done in the background. Quick Books is simple and easy and one of the best Best GST software to manage to account. This Software is cloud-based software that gives the benefit of access to data anytime, anywhere on the internet. The company launched a GST ready version of its online accounting product in the Indian Version. Customized for Indian small businesses, QuickBooks claims it makes it easy for small businesses to track cash flow, create invoices, record expenses, and auto-categorize income or expenses with the Online Bank Connect feature. QuickBooks Online lives up to Intuit’s reputation of providing some of the most advanced accounting solutions on the market. The software offers traditional accounting and is still easier to use than its Desktop counterpart. The software offers a wide breadth of features and has the complex accounting capabilities that small business owners need. Quickbooks offers an unbelievable number of integrations and is evidently working on bettering their customer support (though we still wish they’d add email support). The company has also created a much-needed project management feature, and the ability to pay bills electronically is a welcome addition. 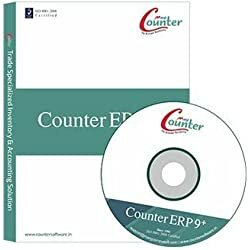 MARG ERP9+ is GST ready inventory and accounting software. The can support retail, distribution, manufacturing, payroll and other features of your business. MARG ERP9+ is also available as app version for mobile. The software’s Retail Point of Sale software solutions is designed to address the challenges of Small & Independent Aspirants, Retailers, and large multi-store Retail Chains. Their sector specific orientation, built using the latest technologies, assure retailers ‘a visible improvement’ in customer engagement, by helping them source the right product at the right price at the right time. The Accounting Software in which you can finalize your accounts up to balance sheet by importing data from any inventory software except bill creation & modification. Moreover, there is also a feature to maintain the customer’s account. All types of vat forms are available according to state wise and you can file e- return online. There are other facilities like – direct SMS of Bulk SMS to Debtors, Creditors, Field Staff or any account group, In the e-mail, there are facilities to send Email through SMTP Like Gmail, Yahoo, Hotmail, Rediffmail, IBIBO etc..as well as to send e-mail through outlook. You can even e-mail softcopy of an invoice to the customer automatically for purchase import. Gen GST is secure GST e-filing and billing software. This software is developed by SAG software. Gen GST provides a facility for unlimited client e-filing. This tool is used only for filing tax returns. Developed by SAG Infotech PVT LTD (Jaipur, Rajasthan, India) and is available in both Desktop and Online variants. The desktop variant is based on .NET Platform and the Online Variant is based on highly secured JAVA language. GST return filing is done online and the payments are accepted via Net Banking, Credit/Debit card, so considering the safety measures for professionals, the software is integrated with secure payment gateways for secure payment transactions. The GST software (Billing and Returns Filing) is OS independent (Online) which means that regardless of OS running on the system, the software is all set to work and operate on the desktop right after installation. Indian businesses can generate specific invoicing format along with sales and purchase invoice, e-way bills, payment voucher, refund voucher, credit note/debit note, shipping bill, purchase RCM and more productive features from their billing software. ClearTax is coming up with new initiatives apart from the main tax-filling application and so multiple new projects are underway. The problems it’s trying to solve exists in real and impacts a lot of people and business in India. It’s a good place to be if you like the idea of being involved in the development of a product right from the beginning. The software is ready to use and is easily compatible with Tally’s accounting software. The company has made the deal attractive by including a complete e-learning training package with the module. Users can constantly learn about GST and also take small tests to test their understanding. Clear tax helps file your tax returns easily or invest in intelligent tax savings options in minutes right from the homepage. They also provide CA-assisted income tax filing service to maximize tax savings for individuals. The cloud-based software ensures that you will not make mistakes or lose data. You can access your returns and data anytime, anywhere. GST Ready BUSY is one of the Best GST software for Accounting Software which is an integrated business accounting software for Micro, Small and Medium businesses. The user interface is simple and intuitive. You can manage your finance, accounting, inventory and CST and VAT reports, etc. Busy offers you POS billing and item barcode printing features, fixed assets and depreciation schedule. 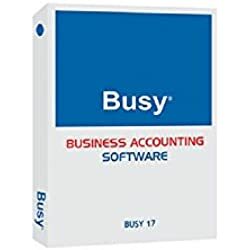 Busy has three editions: Basic, Standard, and Enterprise edition restricted to specific features. The features of payroll, web-based reporting, data synchronization, and multiple branch management in one company are absent in basic and standard edition. You can also manage your postdated cheques and budgets, and add images and notes with accounts and items masters to recognize items and parties during voucher entry. The application software records and processes business accounting transactions within functional modules such as Financial Accounting (Multi-Currency), Inventory Management (Multi-location), Production / Bill of Material, Sales / Purchase Quotations, Sales, etc. The above list of Best GST software in India will help you to maintain your compliance required to maintain your accounting needs. Do share your experience with your friends and also consider sharing this post on social media for even more people can be benefited by it.